I don't like potato salad. I've tried it on numerous occasions and just never cared for it at all. This summer, we were at some friends' house and they had prepared a meal for everyone. There were only a few options that were both gluten and dairy free, and one of them was the potato salad. I shrugged inwardly and put some on my plate, figuring that gross food is better than no food at all. Much to my surprise, I LOVED this potato salad! 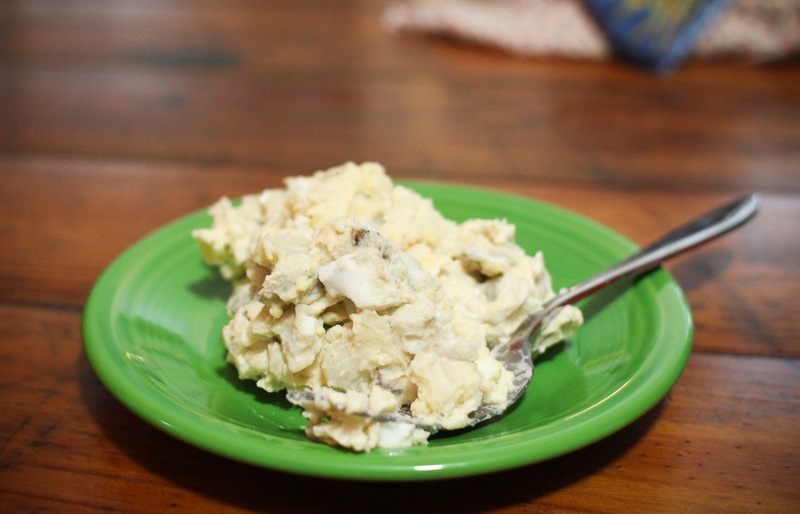 It is so unlike any other potato salad that I've ever had. I went back for seconds... and then probably thirds. It was so good. I begged my friend Jenn for her recipe and she emailed it to me a few days later. I've made it several times since myself and also taken it to a potluck where it was a huge hit. I wash and cut the potatoes to 1/2 inch diced and boil until soft, but not completely mushy soft. Just a minute less than what you would do to make mashed potatoes. Rinse and cool potatoes slightly before mixing with eggs, celery and onion. Put in mayo about 1/4C at a time until you get it to the consistency you like. I do not like mine to mayoey, but I also do not like it too dry. I flavor with seasoning salt and maybe a little pepper if I am in the mood. Reduce the recipe accordingly to accomodate how many you are making it for. If you just wanted to snack on it for a few days, I would probably use 3 potatoes.